Like our Amish woodworkers, we believe that some of the finest memories life has to offer come from the small, everyday moments we spend with our families at home. The Spindle-Back Windsor is a solid oak wood baby high chair that's designed to make the kitchen, the home's natural gathering place, welcoming and safe for every member of the family. With a traditional design and a timeless look, the Spindle-Back Windsor has the beauty and the durability it needs to provide the home with generation after generations of peaceful mealtimes, big smiles, and happy memories. 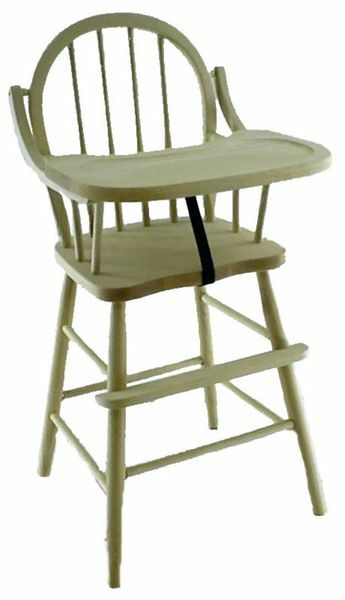 Every element of this high chair is built, sanded, and then finished to order by hand in a small Amish wood shop in the northern United States. As parents themselves, our Amish woodworkers know exactly what it takes to craft a high chair capable of standing up to decades of heavy use and enthusiastic eating. Each surface is meticulously hand-sanded down to a perfectly glossy smoothness that mass-produced pieces just can't match, ensuring that safe use and after dinner cleanup are both a breeze. The menus above list all of the options available on this beautiful heirloom piece. If you'd like to customize this piece in any way not listed above, or if you have any questions at all, please don't hesitate to get in touch with our team at any time by phone or by email - our kids and families are the most important people in the world to us, and we would love to talk with you about the kinds of lifelong memories a piece like the Spindle-Back brings to the home. All high chairs ship to any location in the continental United States for a flat fee of $50.